Photoshop files can grow quite large and saving multiple versions of the same document can lead to huge waste of disk space. Having in mind that even simpler files can take up to 100 MB, a quantity of even 50 unused files will waste 5 GB of disk space. Visual Similarity Duplicate Image Finder provides support for over 100 popular image formats and also 300 RAW camera formats. This of course includes the popular *.psd file format. While a standard duplicate finder can find exact duplicates, it will not help you in such situation where the images are slightly modified or converted to multiple formats. 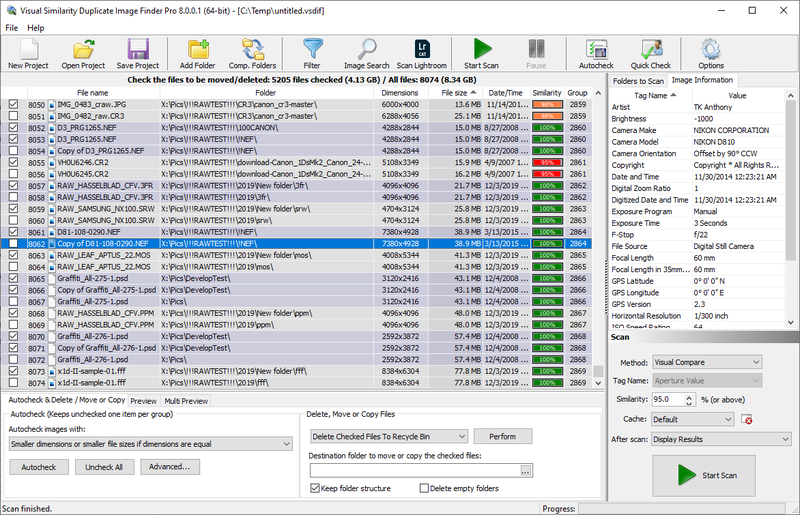 The Duplicate Photo Finder performs a real image analysis and can identify duplicate and similar photos even if they are edited and stored in various file formats. It is the only similarity tool that supports the complex PSD file format. There is a FREE demo of this low-cost tool available for download at the above link. Adobe Photoshop is a graphics editing program developed and published by Adobe Systems. Adobe’s 2003 “Creative Suite” rebranding led to Adobe Photoshop 8’s renaming to Adobe Photoshop CS. Thus, Adobe Photoshop CS6 is the 13th major release of Adobe Photoshop. The CS rebranding also resulted in Adobe offering numerous software packages containing multiple Adobe programs for a reduced price. Adobe Photoshop is released in two editions: Adobe Photoshop, and Adobe Photoshop Extended, with the Extended having extra 3D image creation, motion graphics editing, and advanced image analysis features. Adobe Photoshop Extended is included in all of Adobe’s Creative Suite offerings except Design Standard, which includes the Adobe Photoshop edition. However, in 2013, Adobe announced a new brand – Creative Cloud. And the Photoshop version included in this suite is named Photoshop CC. The CC version( Originally 14.0, and will be continuously maintained and upgraded) has 3D content as Photoshop Extended, which means the standard version is canceled. 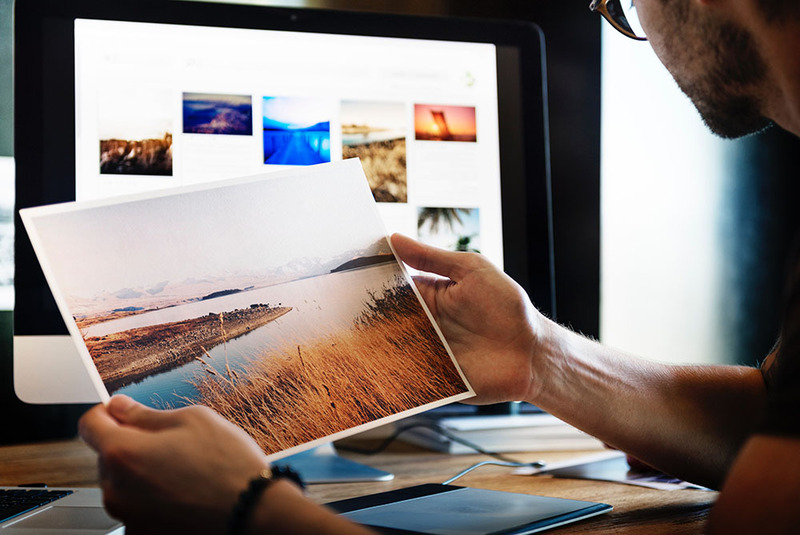 Alongside Photoshop and Photoshop Extended, Adobe also publishes Photoshop Elements and Photoshop Lightroom, collectively called “The Adobe Photoshop Family”. 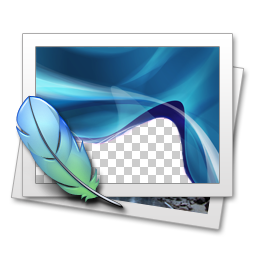 In 2008, Adobe released Adobe Photoshop Express, a free web-based image editing tool to edit photos directly on blogs and social networking sites. In 2011, a version was released for the Android operating system and the iOS operating system, followed by a release of a version for Windows 8 in 2013. Adobe distributes Photoshop in Windows and Macintosh versions. Photoshop files have default file extension as .PSD, which stands for “Photoshop Document.” A PSD file stores an image with support for most imaging options available in Photoshop. These include layers with masks, transparency, text, alpha channels and spot colors, clipping paths, and duotone settings. This is in contrast to many other file formats (e.g. .JPG or .GIF) that restrict content to provide streamlined, predictable functionality. A PSD file has a maximum height and width of 30,000 pixels, and a length limit of 3 Gigabytes. Photoshop files sometimes have the file extension .PSB, which stands for “Photoshop Big” (also known as “large document format”). A PSB file extends the PSD file format, increasing the maximum height and width to 300,000 pixels and the length limit to around 4 Exabytes. The dimension limit was apparently chosen arbitrarily by Adobe, not based on computer arithmetic constraints (it is not close to a power of two, as is 30,000) but for ease of software testing. PSD and PSB formats are documented. Because of Photoshop’s popularity, PSD files are widely used and supported to some extent by most competing software. The .PSD file format can be exported to and from Adobe’s other apps like Adobe Illustrator, Adobe Premiere Pro, and After Effects, to make professional standard DVDs and provide non-linear editing and special effects services, such as backgrounds, textures, and so on, for television, film, and the web. Photoshop’s primary strength is as a pixel-based image editor, unlike vector-based image editors. Photoshop also enables vector graphics editing through its Paths, Pen tools, Shape tools, Shape Layers, Type tools, Import command, and Smart Object functions. These tools and commands are convenient to combine pixel-based and vector-based images in one Photoshop document, because it may not be necessary to use more than one program. To create very complex vector graphics with numerous shapes and colors, it may be easier to use software that was created primarily for that purpose, such as Adobe Illustrator or CorelDRAW. Photoshop’s non-destructive Smart Objects can also import complex vector shapes. Chinese Simplified, Chinese Traditional, Czech, Danish, Dutch, Finnish, French, German, Hungarian, Italian, Japanese, Korean, Norwegian, Polish, Portuguese, Russian, Spanish, Swedish, Romanian, Turkish and Ukrainian. Arabic and Hebrew are added as of Photoshop CS6. Photoshop functionality can be extended by add-on programs called Photoshop plugins (or plug-ins). Adobe creates some plugins, such as Adobe Camera Raw, but third-party companies develop most plugins, according to Adobe’s specifications. Some are free and some are commercial software. Most plugins work with only Photoshop or Photoshop-compatible hosts, but a few can also be run as standalone applications. Adobe Camera Raw (also known as ACR and Camera Raw) is a special plugin, supplied free by Adobe, used primarily to read and process raw image files so that the resultant images can be processed by Photoshop. It can also be used from within Adobe Bridge. This entry was posted in Information, Visual Similarity Duplicate Image Finder and tagged Awesome Duplicate Photo Finder, Best Duplicate Image Finder, Best Duplicate Images Finder, Best Duplicate Photo Finder, Best Duplicate Photo Finder Review, Best Duplicate Photos Finder, Best Duplicate Picture Finder, Best Duplicate Pictures Finder, CNET Duplicate Photo Finder, Duplicate Photo Finder, Duplicate Photo Finder iPad, Duplicate Photo Finder Lifehacker, Duplicate Photo Finder Mac, Duplicate Photo Finder Online, Duplicate Photo Finder Picasa, Duplicate Photo Finder Review, Duplicate Photo Finder Windows 7, Duplicate Photo Finder Windows 8, Duplicate Photo Finder Windows 8.1, Duplicate Photo Finder Windows Vista, Duplicate Photo Finder Windows XP, Duplicate PSD Finder, Find Duplicate Photos, Find Duplicate Photos Windows 7, Find Duplicate Photos Windows 8, Find Duplicate Photos Windows 8.1, Find Duplicate Photos Windows Vista, Find Duplicate Photos Windows XP, Find Duplicate Psd, Find Similar Photoshop Files, Find Similar Photoshop Files Windows 7, Find Similar Photoshop Files Windows 8, Find Similar Photoshop Files Windows 8.1, Find Similar Photoshop Files Windows Vista, Find Similar Photoshop Files Windows XP, Find Similar PSD, Free Duplicate Image Finder, Free Duplicate Images Finder, Free Duplicate Photo Finder, Free Duplicate Photos Finder, Free Duplicate Picture Finder, Freeware Duplicate Photo Finder Download, Similar Photoshop Files Finder, Similar PSD Finder, Visipics on February 27, 2014 by MindGems Support.